We are one of Calgary’s top rated residential plumbing companies, but we also carry that level of service and quality to our commercial plumbing. Our exemplary customer service, up-front pricing policies, fast response times and unwillingness to sacrifice quality, have made A Better Way Plumbing & Heating Calgary one of the top 3 plumbing companies in the city. 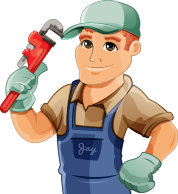 That level of service and attention to detail extends to all of our commercial plumbing and heating work as well. Jason and our team of plumbers wouldn’t have it any other way.